As of August 19, 2017, the still water levels are currently about eight-inches elevated water level ABOVE predicted tides. We expect the August 17-22 high tide event will be similar to the July event, exceeding 3 ft of still water level. Parts of Waikiki Beach will fully be inundated at high tide with thin sheet flow wave run up with tide levels plus wave run up above 3.5ft above mean Sea level. The +3.6’ run-up elevation appears to be a threshold for when most of Waikiki Beach is over washed with waves. Other low areas may experience recurrent flooding and ponding similar to the last event in May. These areas may be compounded by rainfall, see weather forecast below. Above-normal sea levels continue around the Hawaiian Islands and high sea levels are propagating westward near the equator. In the north-central Pacific away from the equator, sea levels have slightly fallen since last month. The Honolulu tide gauge anomaly was +20 cm during April, +17 cm during May, and +9 cm during June. Hawaii regional sea surface heights were also above-normal during June as observed from satellite altimetry (+8 cm) and model analysis (+6 cm). Near the equator in the central Pacific, sea levels >15 cm above normal are observed from satellite and model analysis. Sea level anomalies are smaller in the Southern Hemisphere. Flooding at the shoreline will depend largely on wave conditions and weather. o Reduced drainage and flooding around the coastal storm drains, especially if there is heavy rainfall. For more information and links to forecast products visit www.hawaiisealevel.org. For additional information on personal preparedness please refer to the City and County of Honolulu Department of Emergency Management Hurricane Preparedness section or you can check the University of Hawaii Sea Grant for the Hawaii Homeowners Handbook to Prepare for Natural Hazards. Monitor the weather forecast for heavy rainfall as this will exacerbate tide-related drainage and ponding issues. The forecast currently looks ok for rain and weather during the high tide episode. You may want to consider taking mitigative measures to prevent flooding from wave run up and low elevation ground-water inundation (basements and parking garages). The preventative measures utilized in the past 2 events may be appropriate for this week’s high tides as needed. The State DLNR is advising all emergency sand bags and associated flood mitigation material needs to be removed from the beach immediately after the high tides subside. If you have questions or concerns on what to do contact me for assistance. Note the Honolulu anomaly is approximately 8 inches higher than forecast. This graph shows the tide (solid line) plus forecast wave run up (dashed line) from the offshore wave buoys. 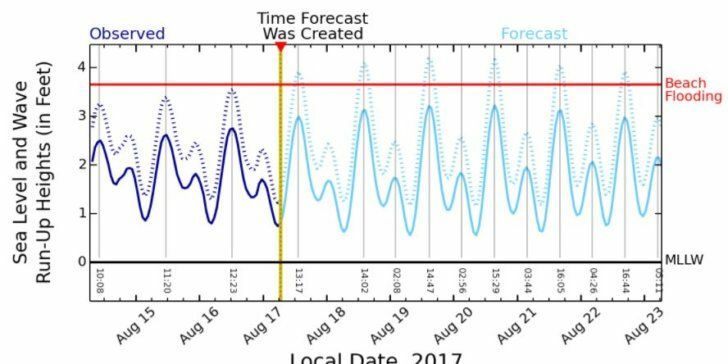 This model forecasts minor beach flooding to occur August 17-22 an hour or two either side of the peak high tide in the afternoons, noted at the bottom of the chart. July 4, 2017, NASA Sea Surface Height Anomaly Image. 2525 Correa rd. HIG 206 Honolulu Hi 96822 U.S.A.